Winter storms in Oregon and sub-freezing temperatures have covered most of the state in ice and snow. Just now the day is brightened with a sunny break between storms. I'm watching the Mountain Quail scratch through the snow at the base of my garden bird feeders. The small Nuthatches and larger Jays spill seed as they eat, leaving a scattering of food for the ground-dwelling Quail. They skitter from feeder to feeder leaving trails in the snow. The national economic and political challenges are affecting everyone. I hope that whatever storms have come into your life this past year, you find a nurturing sunny spot. When (not "if") I feel stressed reading the stormy news reports, I look for something that enables me to make an immediate positive change. One of my favorite ways to respond to stress is to make something. Writing, painting, decorating (moving things around my house or painting a wall) or cooking are my default creative activities. I've written a master recipe for Breakfast Scones that has a lot of creative options. It's a fun recipe to bake during the Holiday Season. Warm and Happy Holiday Wishes! Gottshalks department store obtained 2 images from my Spanish Rose Series for their entry foyer in the new Gottshalks in Bend, Oregon. ASU Arizona State University Museum of Anthropology is exhibiting my 16'6" charcoal drawing, Love Always (Siempre Amor) for their 9th Annual Dia de los Muertos Festival exhibit, Oct. 28, 2008 - Jan. 29, 2009.This beautiful exhibit features Chicano / Chicana art. 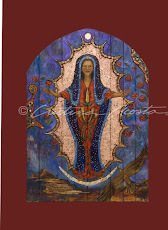 Central Oregon, High Desert Gallery Sisters, Oregon, is exhibiting my series of Madonna retablos (altars) in their gallery. This beautiful Nativity retablo is part of the exhibit. 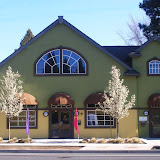 Along with painting, I continue to write design articles regularly for Latina Style magazine, and offer color consulting services to home and business owners choosing paint colors in Bend, Oregon. 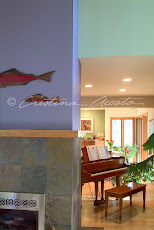 I like sharing home design ideas with clients. Clients save paint, time and money while choosing paint colors for their homes and businesses. Are you home for the holidays or ready for a leisurely breakfast? Try making my scone master recipe. Scones are quick to make for a special morning breakfast. These scones are beautiful to look at, they taste wonderful and the scent of baking scones filling the house is enough to get most anybody to the breakfast table. If you want to make dairy free scones, substitute non-hydrogenated shortening or lard for the butter and plain or vanilla soy milk (or other type of milk) for the cow milk. You can alter the ingredients to make a variety of scones. Some of my favorite scone variations are: Cherry Pecan (with dried tart cherries), Wild Blueberry, Cranberry Orange Scones (orange zest & dried cranberries), Lemon Poppyseed (with lemon zest), Chocolate Orange Nut (with orange zest, chocolate drops & nuts). Experiment and have fun with this recipe. 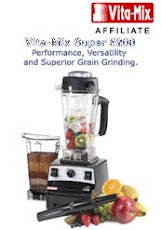 1/2 cup dried fruits such as: raisins, chopped apricots, pitted cherries, sweetened cranberries, etc. 2 Tablespoons fresh orange or lemon peel zest (don't scrape off the white part of the rind as it will be bitter). Spray a baking pan with release or grease it with butter/shortening. In a large dry bowl mix together the dry ingredients: flour, baking powder, sugar, sea salt. Using a pastry cutter, food processor or 2 dinner forks, cut the butter into the dry mix until the mix resembles coarse meal and there aren't any chunks of butter much larger than 1 grain of rice. Add any fruits, nuts and/or spices to this mix. All at once add the wet mixture to the dry mixture and stir just until the dry mix is saturated. Don't over mix or the scones won't rise. Dust a little flour onto a clean counter and after flouring your hands, pour the batter on to the counter (it should be almost like a very wet biscuit dough). Sprinkle a little flour on the dough and knead it for about 5 - 10 strokes. To knead the dough, pat it down til it's easy to grab the far edge. Bring that edge over the front edge of the dough (by your belly) and make push it together hard with both hands. Do this a few more times, turning it until the dough is easy to pat into a shape. (Sprinkle on more flour if dough is too sticky). Pat dough into a circle about 1" thick. Just like you'd cut a pie, cut the dough into wedges. Transfer the dough to the pan (with a pancake spatula) and spread them on the baking pan at least 1/2" apart so they won't grow into each other as they cook. Bake the scones at 425 until browned. About 15 minutes. Writing in my studio with all of the comforts of modern heating, plumbing and groceries, it's hard to remember that for most of the history of humankind, winters in the snowy and cold regions of the globe were often life-and-death seasons of hardship and possible starvation. Watching birds reminds me of reality of life for all of the other creatures on our planet, and reinforces to me that as a human I have a responsibility to nurture healthy eco-systems. This morning the thermometer was around 10 degrees Fahrenheit and it's been snowing most of the day. Between work sessions I've been sweeping snow off the walkways (easier than shoveling, but I have to do it more often) and stocking the bird feeders. The seasonal birds have migrated south and only the stalwart local wild birds remain. I like watching the Chicadee's, Jays and Mountain Quail vie for their positions at the feeders. Even though I live in the town of Bend, Oregon, we have a 1/2 acre lot that we've mostly xeroscaped in the indigeneous flora mix of manzanita, red currant, ponderosa pine and bunch grass. The birds visit the feeders while the coyotes, mule deer and bunnies come to the mineral salt lick. Wherever small birds group, a hungry raptor will eventually show up for a meal that is never vegetarian. I watched owls, hawks and eagles hunt the small birds at the feeder. They fail much more than they succeed, but despite that they always persevere with the hunt, though never from the same angle. I've long ago given up cheering for either "side" of the hunted/hunters of bird world. They each have their place. Nonetheless, because I see so few raptors in relationship to the usual birds, I always stop and watch them. One day in November, I heard the bump of a bird hitting the glass windows while I was writing. That's not unusual as the occasional bird will zig rather than zag when they're flying around the garden. Leaving my studio, I opened the door to find a beautiful raptor dead on my doorstep. The bird, a Sharp Shined Hawk, had broken it's neck when it hit the window and died instantly. It lay on it's back in the center of my doormat with it's wings perfectly outstretched, looking like a symbol on a flag. I reached to touch it and stopped when I heard a loud, rumbling growl. I looked up to see the neighbor's cat, Harry, in full wild-cat mode, ready to fight me for the bird's body. I quickly picked up the hawk and brought it into my studio, letting my Rat Terrior out to chase Harry the cat. (The dog lives to chase that cat). I drew this graphite drawing of the dead hawk laying on my work table. Yesterday a very much alive and hungry Sharp Shined Hawk flew by the window, finishing a failed swoop after a Quail. I wonder if it's related to the hawk in this drawing. Sometimes things happen that seem so mysteriously destined that I'm amazed at the richness of this universe. About 4 or 5 years ago a man called my business number and asked if I had any interior design need for furnishings. He was a semi-retired fine carpenter and furniture maker and was looking for new business contacts. Once he told me he was practicing his business skills on me, we both relaxed and chatted a bit, talking about what it was like to be one of the very few Mexican-Americans (Chicanos) in Oregon during the 1980's. I told him about my series of retablo paintings of Madonnas that I was working on. He then told me that he had something he needed to get rid of before he retired, and that I might be the perfect person for it. He said that he had a Catholic Church confessional from a church that had been closed. Though he was vague as to how he came by the piece, he'd had it for over 30 years and asked if I would like to buy it. Without photos I said no, though it sounded interesting. 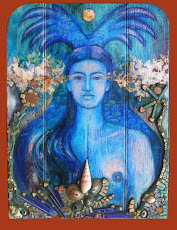 After our conversation I sent him a postcard of one of my retablos, La Conquistadora / the Corn Maiden / Dine Spider Woman. The next month and for about 6 months afterward, the man would check in with me to see if I'd like to buy his confessional. I never saw a photo and always said no. Then one Saturday morning he was parked at my studio in a work van with a friend. I was stunned that he had driven over 2 hours over a mountain pass and hadn't called to even see if I would be there. My husband, Randall had been at work (at that time our work spaces were in the same building) early to catch up on things and met the man when he knocked on my husband's door to ask if he knew where I was. I drove up to the studio building to see Randall standing at the back of the man's open van and signaling me the absolutely-no-way hand signals in tandem with the what-in-the-heck-is-going-on eyebrow raise. Stepping behind the van I looked in to see the "confessional" and was struck with amazement. The sections of cabinetry and plastic ziploc bag of "extra parts" looked like nothing but scraps of old wood and a lot of work to my husband, but I could see that what I was looking at was an altar. That was it -- I really wanted that pile of cabinetry. The man and I went back and forth on a price and I bought the cabinet. Randall was totally against the idea, but as it wasn't a "affecting both of us for life" type of decision, I bought it anyway. Fortunately, Randall is a lovely guy who happens to be handsome, handy and dotes on me -- so, he put the cabinet together despite his initial dismay with my decision to buy the cabinet. I was so filled with amazement at the synchronicity and magical quality of life. I cleaned the pieces of wood with Citrus thinner and Randall put the puzzle of pieces together until it was a complete shrine. I asked everyone I thought might know, if they knew anything about the cabinet. Nobody did, but I felt that it was a shrine for the Guadalupe. So, I had my artisan woodworker friend, Terry Scoville, make me 2 wood panels to fit the "holes" left in the cabinet after someone had removed something years ago. 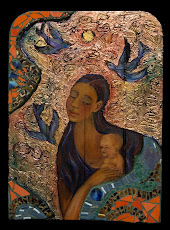 I painted an image of the Guadalupe with Child in oils, 22kt. 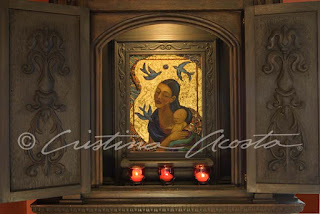 gold leaf, wax and antique ceramic mosaic to suit the intimate space of the shrine along with a thin horizontal insert. Randall installed them. It is beautiful and we get so much pleasure from viewing the shrine. The shrine to Our Lady of Guadalupe is my constant reminder of the strange and often ironic, abundant beauty of life. A couple of years later, while traveling in Taxco, Mexico I saw identical woodwork on 2 confessional chairs in the Cathedral at the top of the hill and knew that the shrine had "found" me. The man from Albany, Oregon had indeed found the "right" home for what he thought was a confessional, but in reality was a Shrine to the Guadalupe. In Mexico, the top part of the cabinet (with the portrait of the Guadalupe) is removed from the stand (or bottom section) and is carried at the head of a procession on Dec. 12th. Sometimes the curtain is across her image during part of the procession, other times not -- it depends upon the local traditions. During the rest of the year, the top part sits on the cabinet in a church. I often light candles I put in the cabinet, or just turn on a light to enjoy it. My friend, Mimi Graves brought me a ristra of local grown red chilies which dried while hanging from the cabinet door. Here's some info about the festival. Catholic traditions include Feast Days which are specially designated days for a Saint or Holy Person. December 12th is the Feast of Our Lady of Guadalupe. In Mexico, this feast is one of the holiest days of the year. Though the concept is not sanctioned by the Catholic Church, some people consider the Guadalupe to be the Christian version of the Aztec Mother Earth goddess Tonantzin. The Our Lady of Guadalupe festival is much more of a tradition in Mexico than in the U.S., though in areas with a lot of Hispanics there are often processions to celebrate the day. Images of Our Lady of Guadalupe are often considered Chicano art, Catholic religious art or Hispanic art -- To hispanics of Mexican-American ancestory, the image of the Guadalupe is a symbol that goes beyond religious affiliations to become an icon of identity. I was raised very Catholic and consider myself a Chicana or Latina. Despite the spiritually seismic shifts I've experienced that re-shaped my beliefs, I love to paint Madonnas and think of them as expressions of the Divine Feminine. You can see more of my Madonnas here. I've been going through my late paternal grandmother's (Abuelita's) photos and putting together an essay that includes a piece of her story as a classical pianist in Los Angeles, California during the 1920's. Though now my grandmother might call herself a Chicana or a Latina, during her generation, Hispanic Americans that were not directly from Mexico, but had a history (often for hundreds of years) in the Southwest called themselves Spanish or (if they lived in California) a Californio (male) or California (female). So I grew up referring to her as my "Spanish Grandmother" when I didn't call her Abuelita (the Spanish word for grandmother). Her name was Catalina Maria Ortiz Acosta and she was a renaissance women who was very cultured and talented. I put together an essay on my site describing her contribution to the classical music scene in Southern California circa the 1920's. I also submitted it to LatinoLA and they published it also. Los Angeles during the early 1900's was not a friendly place for Mexican-Americans and Chicanos. Though originally part of Mexico, California was annexed by Anglos to become part of the United States of America in 1848. With the gold rush of 1842 and other immigration, the existing American Indian and Spanish / Mexican people of California were politically and socially marginalized. By the 1920's lynchings, racially motivated attacks and "anti-greaser" laws were in place to control and dominate the Mexican American (Chicano) population of California. Pressure on Mexican Americans increased and included segregated schools in areas of Southern California where large groups of Chicanos persisted. The famous case, Mendez vs. the Board of Education finally ended Hispanic segregation in the late 1950's. Intelligent, cultured and talented Hispanic Americans were not lauded. In fact, with the veil of racism over many Anglo peoples perceptions during that era, there was very limited press coverage of the positive cultural contributions of Chicanos in Los Angeles. History is written by the "winners", and as a conquered population, Spanish / Mexican Californians have lost many of their historical cultural contributions to a lack of attention. As a third generation Californian (I now live in Oregon), I found some Chicana history within my family that pertains to the larger political climate and the cultural life of elite Angelinos during the early part of the twentieth century. In the early 1920's my grandmother Catalina Maria Ortiz Acosta and her family, lived in Los Angeles. The last of eighteen children, my grandmother Catalina was the daughter of J. Nestor Ortiz and Maria Salazar Ortiz. J. Nestor was a wealthy man who had owned several businesses and a sheep ranch in the town of Ortiz, Colorado (near Antonito, on the border with New Mexico). J. Nestor sold his interests in Colorado and re-located in Los Angeles, California in 1903. Catalina was born the next year. Though her ancestors where among the founding families of Santa Fe, New Mexico (and other towns in the region), she would often refer to herself and family members as "Californios" or "Spanish". Either were terms that people (Anglo and Hispanic) in her generation used to refer to the Spanish families that lived in the American Southwest when that region was under the control of Spain/Mexico. Because she was born in California, the term "Californio(a)" is accurate, but not completely reflective of her cultural heritage. The term she used usually depended upon her sense of the listener's knowledge of these finer points of cultural history. The Ortiz family befriended Charles O. Roos and his wife, Jaunita E. Roos. The family connection was certainly enriched by Catalina's friendship and professional relationship with Jaunita. Catalina (1904-1991) was then a twenty year old classical pianist and the featured pianist at concerts the Roos organized. My grandmother spoke with admiration regarding Juanita's musical abilities. Charles, an Easterner, moved to Los Angeles and worked as a newspaper feature writer when not involved with his work as a lyricist. His wife Juanita was a gifted pianist. They collaborated to create a variety of piano compositions. Charles also wrote poems and lyrics for other composers' music. The concert program for the event at the Ramona Convent in Alhambra, California illustrates the typical concert Roos organized. Nordskog Records recorded the concert. Unfortunately, I don't have a copy of that recording or know of it's existence. Sifting through my Grandmother's photo albums I found several photos of Charles and Juanita. The photos of the people in the Native American outfits are my grandmother Catalina, and Chief Yowlache, dressed in traditional Native American clothing for publicity photos that Roos used in his concert promotions. Chief Yowlache was the "Indian baritone" for the program. Catalina accompanied him and also played solos. During a time of escalating social injustice. . . READ MORE. NOTE: All photos copyright Cristina Acosta. Party in Bend, Oregon for Barb Buchan this Wednesday! Have you seen a Bejing Gold Medal up close? 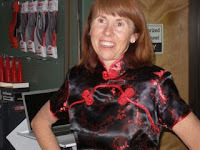 I hadn't until my friend, the ever - inspiring Barbara Buchan won 2 Gold Medals in Cycling in Bejing this past summer. Not only is she talented and hardworking, Barb is 52 years old! Barbara Buchan began her athletic career as an able-bodied athlete and had Olympic dreams until she went down in a cycling accident over 25 years ago. She suffered a terrible head-injury that left her "dead" more than once. After a decade of rehab and the will and perservera nce to put one foot in front of the other no matter how long her journey was predicted to be, Barb defied the odds. She re-created her body, her life and her goals. She went to the Paralympics a few times, but never gave up on her goal to podium regardless of the suggestions she received to "retire". As a result of her accident, Barb became a very right-brained thinker. She constantly pays attention to art and design and actively creates craft and art pieces for her friends and family along with her devotion to tweaking the interior design of her home. 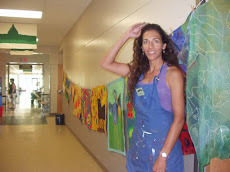 Barb Buchan is an amazing inspiration and example of the creative life. I've written about Barb Buchan before. Here's a link to that post. I encourage you to drop by Rebound this Wednesday and say hi to Barb. Welcome her home and congratulate her. She won 2 Gold Medals in Bejing!!! Who: Everyone – This event is open to the public. When: Wednesday, Dec. 3rd, 5 - 7 p.m.
Barb is a Paralympic Cyclist, Gold Medalist, and a World Record holder. She is an inspiration to us all. Ask Cristina: Which Color Should I Use for the TV Accent Wall? I just purchased paint from Benjamin Moore 2159-40 (amber wave) and AC-9 (Nugget). These colors seem too dark. The Benjamin Moore specialist suggested that we use the Nugget as the accent wall. For some reason it doesn't look too good. Can someone suggest a color that will complement (Amber Wave) or a color that we can use as an accent wall with the color (Amber Wave). Oh by the way the room is in the basement and it is the longest wall in which we plan to put the TV on. From the sound of your note, you're planning on keeping the Benjamin Moore wall paint color, Amber Waves and replace the Nugget. You haven't said anything about your decor, so my advice is a bit of a shot in the dark. Nonetheless, here goes! I like the color Amber Waves as it's a light and happy gold and would likely be a good choice for a basement color as it's not full of black. The Nugget didn't work because it's a bit blah against the Amber Waves, and the value (the relative lightness or darkness of a color) is too close. Because your accent wall is the TV accent wall in the basement, I'd go for some drama. Here are some deep, rich tones that accent the Benjamin Moore Amber Wave color: Amazon Soil 2115-30 (a beautiful rich and dusky eggplant purple); Pine Cone 2106-30 (a rich warm brown) and Cinnamon 2174-20 (a gorgeous earthy red). Don't chicken out and choose a blah (in comparison) accent wall color. An accent wall is all about drama -- choose a bold color. Don't worry about the darkness of the color -- the basement is dark already -- put in dramatic color and add lights to highlight any posters, art, or play areas like pool tables and card tables. A lighting expert can help you get dramatic yet practical results. 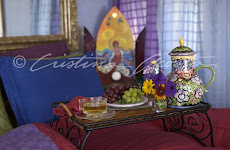 I'd love to see what you ended up doing, send me the before and after photos..
Read more color advice on my website.